The theme for this year's AAW POP - Professional Outreach Program - is 'Creativity in Construction: A Collaboration of Materials' meaning the use of more than one material. My submission was a combination of sterling silver and wood. I love to look at photos of the fabulous Fabergé eggs, which inspire me to try new techniques and push the limits of what can be achieved with an ornamental lathe. 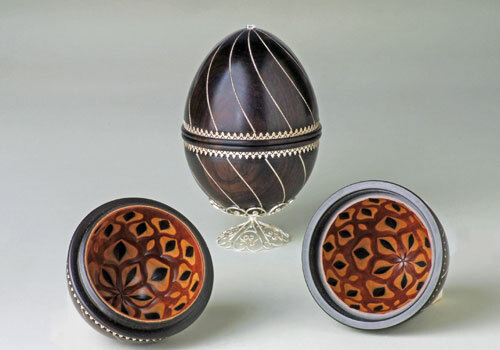 The egg is basically a wooden box with a threaded lid. It opens to reveal a surprise of colour and pattern. I start with the main body of the egg in African blackwood (Dalbergia melanoxylon), then fit a mating piece of maple (Acer saccharum) inside. Next, I hollow the maple and fit a mating piece of brown ivory (Berchemia discolor) inside. After hollowing, the result is thin layers of the contrasting woods, which are cut through with an ornamental lathe to reveal a kaleidoscope pattern of colours. The brown ivory wood is hard to come by here in the US and the piece I used came from the Dale Nish wood collection. The exterior of the egg is decorated with sterling silver. I use the new Argentium alloy of silver in all my work because it is highly tarnish resistant. The ornate silver bands around the circumference are held in place by a retaining ring of matching blackwood. The twisted silver wire is inlaid into a groove cut into the wood. Finally, I added an old Russian faceted CZ - cubic zirconia - stone on the top and a fresh water pearl on the bottom. The base is handmade sterling silver filigree - I do all my own silver work. The thing I enjoy the most about doing one-of-a-kind artwork is the creation of a unique design. I envision what it is that I want to make and then figure out how to make it. Often, I need to make several prototypes to solve problems such as holding the work, cutting the pattern, making custom cutters, etc. The rose engine ornamental lathe is just one of the many 'tools' that I use to create my artwork. Recently, another woodturner referred to me as a 'rose engineer' and I think that describes me very well.